Microsoft and German consulting company IAV transform your instrument gauge into a screen to check your email. We spend hours commuting in cars each day. Autonomous driving promises to free us from the drudgery of stop-and-go traffic—but then what do you do? Microsoft has an answer: get some work done. 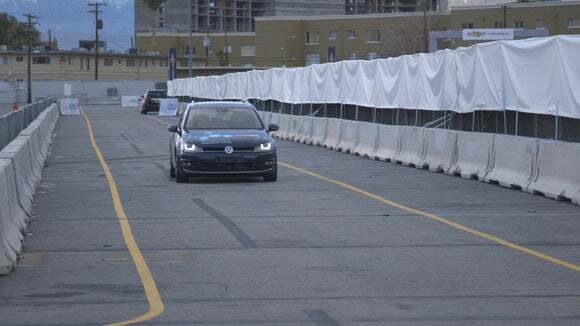 At CES, German consulting company IAV and Microsoft demonstrated a near-production Volkswagen Golf whose driver-side instrument cluster was just a large LCD display. The difference is that unnecessary dials and gauges—your engine temperature, for example—could be shunted aside and replaced with what was essentially a laptop display. And there, using the power of Windows 10 Continuum, the driver could display Windows 10 applications. Normally, you wouldn’t think of checking your email while flying down the freeway. But in stop-and-go traffic, at slow speeds, automated driver assistance can keep the car in the proper lane, and accelerate and brake to keep up with the flow of traffic. At that point, your attention is free to wander in other directions. Yes, you could use your phone to check your email, but why would you? The demonstration IAV and Microsoft showed off used a Golf connected to a Lumia 950XL via a dedicated USB-C cable; a Microsoft Display Dock was built right into the car. In the future, wireless connections will replace these, executives said. As we zoomed down a test track at 30 km/h, Lars Eggenstein, an engineer at IAV, tapped a button on his steering wheel. “Cortana, what’s my schedule look like today?” A list of appointments filled his screen. There is no keyboard; the idea is that a driver would use Cortana to navigate through apps and data. Virtually any universal app would be accessible through the display—yes, even Netflix—save for Maps, which would most likely be replaced with an app supplied by the automaker, Eggenstein said. For Microsoft, Windows 10 is a nice opportunity to re-enter the car, a market it pioneered and then lost. Microsoft originally co-developed the Sync system with Ford, then lost the next-generation technology when Ford decided to go with BlackBerry’s QNX operating system instead. Microsoft developed smartwatches (the SPOT watch), connected set-top boxes (WebTV and later MSN TV) and tablet PCs (the TabletPC) years before they became mainstream, with generally similar results: once it re-committed to them, it was years behind. As autonomous cars take on more and more responsibilities, it’s possible that we’ll se car interiors become more like modern living rooms and offices. And Microsoft hopes to be the OS that powers that space, just as it wants to be the OS driving your office and living room. The IAV demonstration also showed off a second technology: device-to-infrastructure communication. A woman wearing a Microsoft Band 2 suddenly emerged from between two parked cars. LIDAR, radar and other autonomous driving technologies can sense objects from a great distance away, but they might not act quickly enough in certain cases. In the demonstration, the Band 2 announced its presence via Bluetooth. Once within range, the car automatically slowed, then sped up as it determined that there wasn’t any hazard. It also used the heartbeat sensor as a security device—in this demo, the woman wasn’t able to take off her Band and drop it in the street, just to mess with us and force us to slow down. The flip side of this technology is that the infrastructure could eventually “know” what’s around it and route traffic accordingly. In a related demo, our car came to a stoplight. Normal traffic patterns would hold you at the light for about 100 seconds or so. But, since the traffic light didn’t sense any traffic or pedestrians, it dropped the wait time to 20 seconds. It’s unclear how a smart car would cope with a crowded city center and dozens of Bluetooth signals whizzing by. But so far, most of the communication technologies I’ve seen have involved vehicle-to-vehicle communication for safety and to improve traffic flow. The Microsoft-IAV demo involved Windows 10 in the dash, autonomous driving, and vehicle-to-device communication—all just science fiction a decade ago.